PHOENIX, Mar. 11 - The services sector continue to be the growth engine of the U.S. economy, accounting for 73% of all American jobs in 1998, up from 72% in 1997, according to U.S. Bureau of Labor statistics. Since 1993, services companies have added over 6.3 million jobs to the 71.4 million U.S. work force. Which means that some 43.6 million Americans now work for private services companies, up 2% from 1997. Another 8.6 million serve the taxpayers in the three-tier government jobs, up 1.1% from the year before. At a first glance, therefore, it looks as if everybody is a winner in America's new, services-driven economy. But only at a first glance. For, once you start to peel the onion, you begin to see that Corporate America is the only winner, since more services means more, yet cheaper jobs. For example, the average 1998 wage in the private services sector was $7.26/hr, as compared to $12.30/hr in private industries, and $13.03/hr in government. Which means that an average worker in the services business earns only 59% of that in industrial, and 55% of that in government jobs. That's music to the ears of business owners and managers, but a sad tune for an average American wage earner. Income inequality is also widening between the top and the bottom jobs, both in the services sector, and across the board. While the percentage of top wage earners almost doubled in the last five years (from 4.3% in 1993, to 8.0% in 1998), the share of the jobs paying only between $5/hr and $10/hr increased from 50.6% to 52.9% in the same time frame. In the services sector, the gap between top and bottom jobs is even wider. The percentage of the top services wage earners rose from 4.2% in 1993, to 7.4% in 1998, while the share of the jobs paying only between $5/hr and $10/hr increased from 51.5% to 56.8% during the same time. Which means that there are now more people making more money at the top, and more Americans making less money at the bottom of the jobs pyramid - than there were five years ago. As the Clinton administration and the economists hailed the supposed strength of the U.S. economy, especially in contrast to the Asian crisis, the Washington-based Center on Budget and Policy Priorities (COBPP) released a devastating report last year. Income inequality has been growing in 48 of the 50 states. Only in Alaska and North Dakota has the gap between the incomes of the richest and the poorest residents narrowed over the past 20 years. Nor did the so-called "middle class" fare much better. The incomes of MIDDLE income families DROPPED by 22% during the same period. "Robust economic growth in recent years has done little to turn around the long-term trend toward increasing inequality," said Kathy Larin, co-author of the report and a policy analyst at the Center on Budget and Policy Priorities. And guess where the Great American Divide, which separates the rich and the poor, is widest? New York. The Big Apple is also leading the nation in terms of the gap between HIGH-income and MIDDLE-income families with children. The latest census data merely confirm the earlier trends. The same Washington-based research organization noted that, the wealthiest ONE percent of Americans received as much after-tax income in 1994 as the bottom 35% of the population - COMBINED. And that the top 20% of the population had nearly as much income as the bottom 80%. The 2.6 million wealthiest Americans (top one percent of the population) had as much after-tax income as the 88 million with the lowest incomes (bottom 35% of Americans). Furthermore, the U.S. job statistics are distorted by government officials and/or other pundits who ignore the nearly two million able-bodied Americans who are languishing in the nation's prisons, according to a Wall Street Journal Mar. 12, 1999 story. At the present rates of incarceration, the U.S. Bureau of Justice has found that 5% of Americans (13 million) would be imprisoned at some point in their lifetimes. Rather than producing in the country's factories or offices, such a high number of incarcerated citizens is yet another sign of America's social strife, exacerbated, in part, by the income inequalities. So any time you look at the U.S. unemployment or wage statistics, remember to tack on another two million people who may be willing, but are not able to work. Plus a few million of illegal immigrants, who are willing, able, and working in the American black market for jobs. But even such "bad news" about the income inequality for an average worker who still had a job was relatively good news compared to that which some 600,000 Americans received in 1998, who lost their jobs through corporate downsizing, according to a Fortune magazine Feb. 1, 1999 report. The government's latest statistics also showed a 3% drop in the manufacturing jobs, and a 10% decline in employment in the nation's mining employment. Of course, there is nothing new about that. 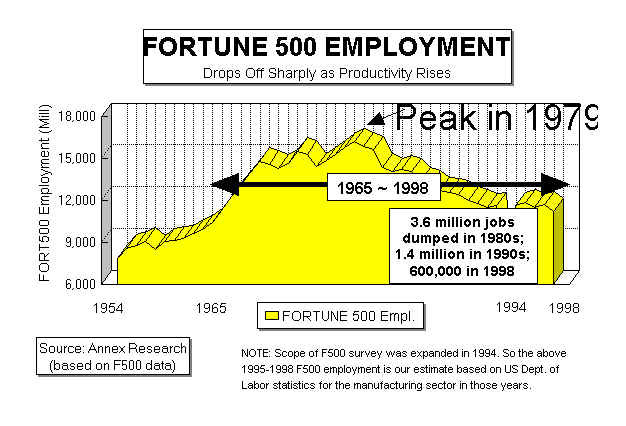 The Fortune 500 companies have been downsizing for the last two decades. In the 1980s alone, they dumped some 3.6 million jobs like so much excess baggage. And they have shed another 1.4 million in the 1990s to-date. No wonder the Fortune 500 employment peaked in 1979. Yes, that was 20 years ago! But while the while the Fortune 500 companies were downsizing, small American entrepreneurs created 1.5 million new businesses and 21 million new jobs in the 1980s, according to a Wall Street Journal Sept. 26, 1996 report. The latest job statistics show, however, that the overall U.S. job growth is starting to slow. In 1998, the U.S. economy generated 710,000 new jobs, up only 1% over 1997. Such a growth rate is less than half that a year ago, when total number of U.S. employment rose by 2.1%, led by a 2.7% surge in the private sector jobs (see "The Upsizing of America," Annex Bulletin 98-12, 3/12/98). There is no sign of slowing, however, in the banking, insurance and real estate services sector. Employment in this segment surged by 5.7% in 1998, to over 3 million jobs, after a 4.1% jump in 1997. But considering that this sector accounts for only 4.2% of the U.S. jobs, its positive impact on overall employment was limited. Or check out also "Two Faces of Globalism", and "Russia Is Still the Bogey" Annex Bulletins.